If you keep up with the news, you will have heard about several recent celebrity deaths due to suicide, such as Avicii, Kate Spade and Anthony Bourdain, all of whom struggled with depression. Depression is an important topic, and it’s why we’ve talked about mental health before, and will continue to highlight the symptoms and how it can be treated. Let’s talk about what depression is, where it comes from, and most importantly, what you can do about it when it hits. Depression is a medical condition that affects 1 in 4 Canadians at some point in their lives, enough that they need to seek treatment. Depression is similar to sadness or grief, but it persists for weeks or months, possibly with no explanation or reason. Some people will experience it once, and others will have it recur chronically over their lives and struggle to deal with it. Doctors use a manual called the DSM-5 to diagnose mental disorders, as these different types of depression often need different treatment. There are three primary types: major depressive disorder, dysthymia and bipolar disorder. Major depressive disorder is quite debilitating; those who suffer are unable to feel pleasure, and experience constant feelings of hopelessness, guilt and worthlessness. Dysthymia, also known as depressive neurosis or persistent depressive disorder, is depression which lasts for longer than two years. While it is milder than major depressive disorder, it can persist for longer, and sometimes these patients experience ‘double depression’, meaning they already have dysthymia when they also develop major depressive order on top of it. Bipolar disorder, which was once referred to manic depression, is so called because these patients experience both highs and lows. By turns, they experience the symptoms of major depressive disorder, then will become excited, need little sleep, and have loads of energy for social, physical and sexual activity. While the manic episode may occur to people as normal, often times manic people feel superhuman, and have skewed perceptions of safety, occasionally harming themselves through their sheer exuberance. Other than these three examples, there also exits substance-induced mood disorder (experienced while taking a drug or after ceasing drugs), premenstrual dysphoric disorder, and disruptive mood dysregulation disorder (suffered by children and especially teens). There has been increasing attention paid to how gastrointestinal conditions can cause or affect diseases that are non-gastro in nature. One example is how dysbiosis – a microbial imbalance in the gut – seems to be a factor in mental health illnesses such as anxiety and depression. Probiotics are effective in restoring that microbial balance, and are being studied for their ability to affect not just anxiety and depression, but schizophrenia and autism. Inflammation is also a factor in a healthy gut and healthy brain; when the GI tract is inflamed, it places stress on the microbiome, which releases cytokines and neruotransmitters. The study in the link above did establish that pro-inflammatory cytokines play a direct role in the development of mental illnesses. There are several different types of pharmaceuticals, and certainly conventional medicine can usually find the right dosage and combination of drugs that effectively manage symptoms of depression, no matter what those may be for any person. However, for those interested in pursuing more of a natural course of action, here are six natural ways to fight depression. Due to the links between inflammation and mental health, along with recommending you eat a balanced diet, I recommend you also focus on adding more anti-inflammatory foods. Turmeric is a tried and true option that you can add as a spice to your foods, or you can whip up in a hot cup of golden tea. Surprise, surprise: leafy greens are also on the list of anti-inflammatory foods…so nosh away on that kale, spinach or some collard greens. There are several fatty foods that qualify for this list, too: olive oil, almonds and walnuts, and fish such as salmon, tuna, sardines and mackerel. For snacks, fruits such as cherries, oranges, blueberries or strawberries will help to keep down the inflammation. As discussed above, the condition of your microbiome can have an impact on your mental health, and are often called ‘psychobiotics’ to reflect that connection. To increase the probiotics you’re consuming, look to kimchi, kefir, yogurt, kombucha, and sauerkraut, as these will help reduce inflammation. As well, consider prebiotics, which are helpful in nurturing good bacteria; these include garlic, onions, leeks, dandelion greens, and Jerusalem artichokes. Exercise helps your whole cardiovascular system, but it also soothes your soul. When you’re feeling blue, the best thing you can do is fit in a yoga class, a high intensity workout or a walk. Exercise reduces cortisol levels and increases serotonin – this serves to reduce stress levels and lift your mood. Joining others in a workout or dropping in at a neighbourhood gym will also get you out of the house and connected with people, which are both important steps for people suffering from major depressive disorder. Once again, a blood test can tell us a lot about what you might be missing that could be contributing to the severity of your mood imbalances. Zinc is an excellent example, because it supports enzyme-enabled reactions, the development of neurological networks and communication. Some of the symptoms of B12 deficiency are the same as depression, so it can be hard to tell where one ends and the other begins. 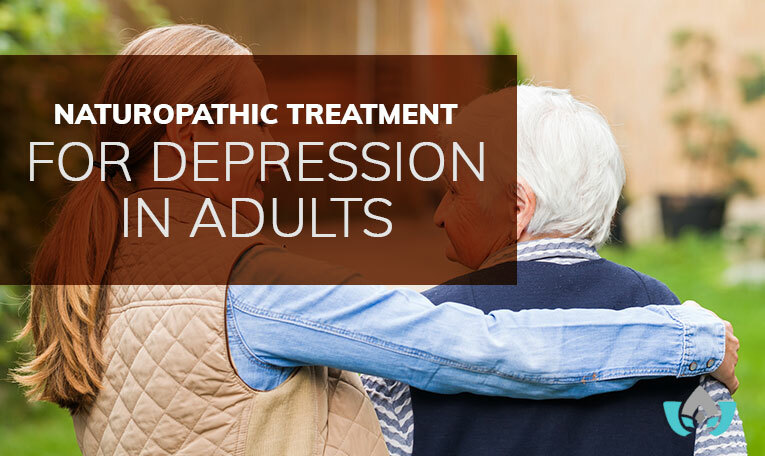 However, because it helps with symptoms such as fatigue, confusion, weakness and difficulty concentrating, it can be leveraged to alleviate those symptoms of depression. Vitamin D has been a go-to for many years for both infants who can’t go in the sun, as well as adults who suffer from seasonal affective disorder. Vitamin D is associated with sunshine, and during the winter or a particularly grey stretch of time, people often feel lethargic, irritable and moody. These symptoms are similar to depression, so you may need to take vitamin D more regularly, but after a short while, you should feel some alleviation of your symptoms. Although more studies are needed, the links to omega-3 helping with depression are generally accepted, and research so far shows improvement in symptoms when omega-3 is supplemented for approximately 8 weeks. You can either take this fatty acid as a capsule, or you can incorporate more enriched eggs or orange juice, ground flax, and fish into your diet. As a naturopathic doctor, I see many people who suffer from depression and anxiety, and who are finding it hard to get the support they need through conventional medicine channels. One of the great features of an ND is that we spend more time with our patients than a family doctor, so we’re able to identify possible triggers to conditions and symptoms to offer treatment foryour individual case. If you feel like you suffer from any of the symptoms above, I encourage you to call now to book your free assessment with me, and let me help you with a healing plan for your pain.